Google announced on Google+ a new automated feature to let you automatically set scheduled uploads for your AdWords ads. 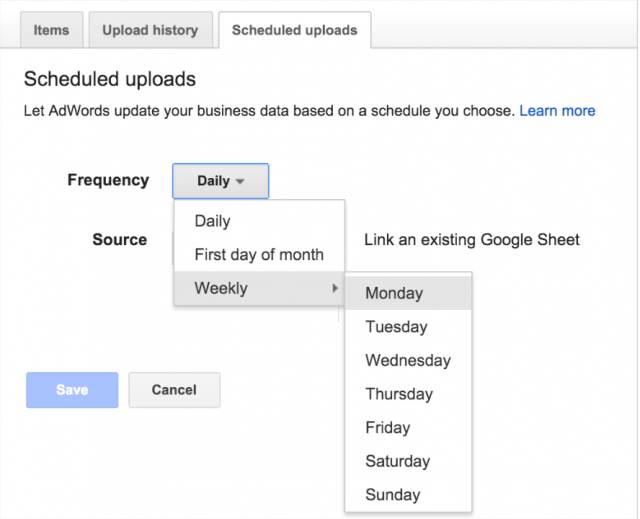 Google AdWords can now automatically update your business data daily, weekly, or on the first day of the month. This sync process can happen without the need to sign in and update this information manually. In the left menu, click Shared library > Business data. Click the Scheduled uploads tab. Select how often you’d like AdWords to update your data from the “Frequency” menu. Select your data’s format from the “Source” menu. HTTP: Add your file’s URL to the “URL” field, then click Save. FTP / SFTP: Add your file’s URL and the username and password required to access your file, then click Save. For example, let’s say you’re using ad customizers to dynamically insert product inventory into your text ads. Scheduled uploads can help ensure that only in-stock products are advertised, and that the inventory amount and local prices shown are accurate. This saves you time and provides a more useful experience for your customers. Scheduled uploads supports a variety of file types, including: Google Sheets, .csv, .tsv, .xls, and .xlsx; and file sources, including: Google Drive, HTTP, HTTPS, FTP, and SFTP. With this release, we’ll also be increasing the allowed file limit from 50mb to 500mb for .csv and .tsv files to help you scale your workflow.